There are many forms of public activism that may be practiced on public sidewalks and parks. You are all familiar with pickets and literature distribution, so I won’t spend a lot of time with those here – except to add some ideas that might make it easier. If you engage in a lot of sidewalk activism – and like to be ready at all times like I do – you will probably want to gather your materials in a way that makes them easy to carry around in the trunk of your car. You will also want it easy to remove so you can use your trunk for other things when necessary. For this, I bought those large, plastic storage boxes with snap-on lids at Wal-Mart. These help me organize my materials as well as keeping them relatively dry and free from condensation. I carry my stuff continuously, but when I plan to go on a trip, I can just lug one or two of these out and I’m ready to load up luggage. 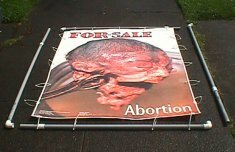 When you are doing anti-abortion street work, you will face a lot of hostility. There will be need for you to "watch your back" – especially if you are, like me, most often alone. Under most state laws, you cannot record private conversations unless everyone involved "consents" – that consent is recognized if they continue to talk after being told that the conversation is being recorded. Check the exact wording of your local laws. We all know that pro-aborts and cops will lie on the stand about what you said and did at the scene – and will lie about what they said. This gives you an edge. The next thing to have in your car is a camera. It is advisable to have a video camera if you are able to swing that. If not, a still camera will be of some help – even the throw-away variety. Again, extra batteries, film, tapes, etc. Always carry a small, spiral notebook pad and a good pen or pencil. Get names and badge numbers of all police officers. Ask if they have a card. Write the date and location on the card. One of the great frustrations I have with a lot of picketers is that they want to enclose their entire dialogue within the four corners of their sign. Lengthy Scripture quotes or debates abound. However, whether you are aiming your signs at the passing traffic or the people entering the clinic (or church; see below), it is unlikely to be effective because, frankly, they can’t be read! The small letters (usually in the kind of imperfect script we tend to use) make it impossible to make your message clear. Try using God as your example. When He wanted to make His message clear, He said, "Thou shalt not kill," "Thou shalt not steal," "Thou shalt not covet" and such. The list is endless. You can come up with ones that will express what you want, but sometimes it takes a bit of thought to come up with a short, punchy one. In most cities it is legal to use something like chalk to write or draw on the public sidewalk. The laws generally prohibit the use of any permanent or near-permanent kinds of markings. However, this can be of great use in anti-abortion activism. Using large sidewalk chalks (available at toy stores), one can put all sorts of messages on the public sidewalks around abortuaries or abortion-supporter locations. Some time ago, there was a group here in Portland called the Hiroshima Project. The night before the anniversary of the dropping of the atomic bomb on Hiroshima they would go around town and draw chalk "homicide outlines" (as seen in cop shows on TV) of people on the sidewalks. The point was to bring home how many people had been killed by the Bomb. 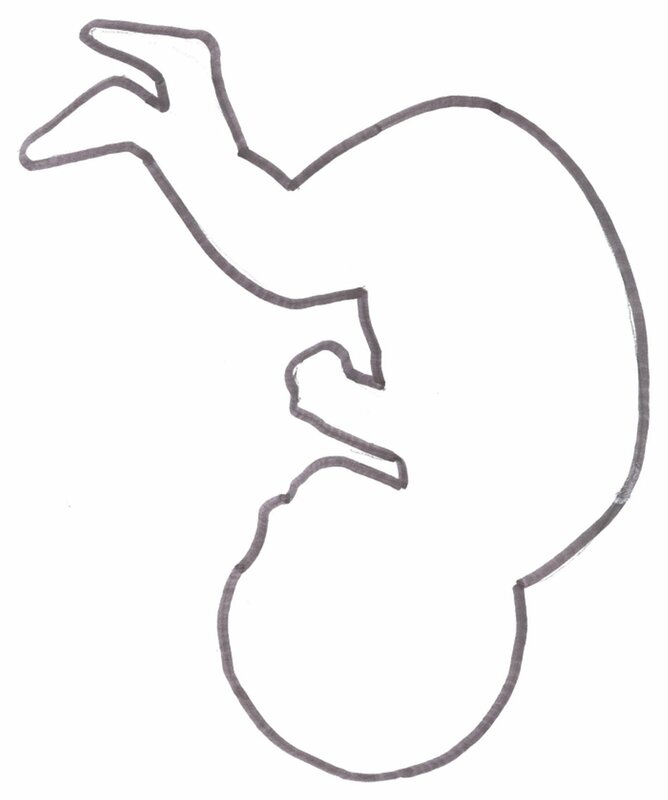 I suggest that a similar idea could be done the night of January 21 – or any time at all around abortuaries – using baby outlines. I have created four different downloadable outlines meant to be templates that fit within a 8 1/2 X 11 sheet of paper. 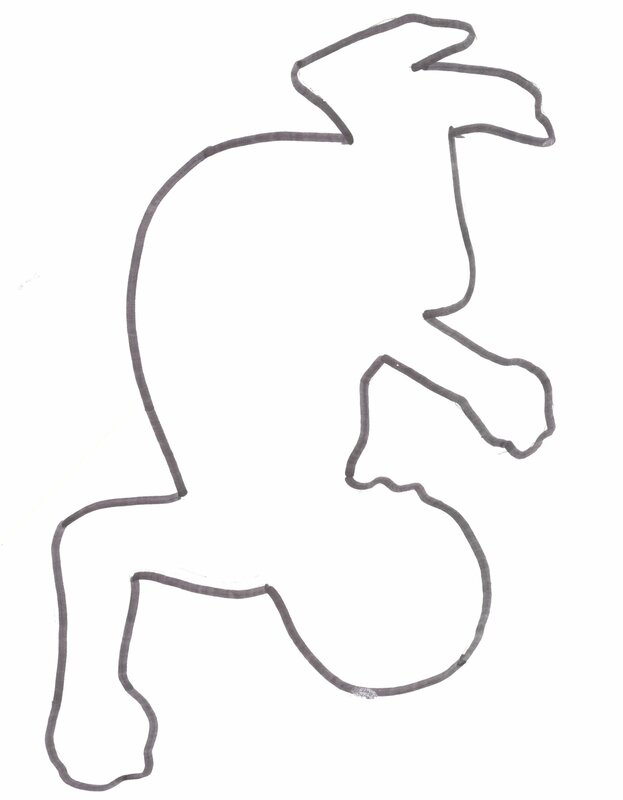 These outlines could be cut out of 1/4 inch plywood (or paneling material) and fitted with a 3/4 inch dowel or 1" X 1" as a handle for quick placement on the sidewalk. Krylon has two spray paints that might be useful (check your local ordinances). The first is an industrial water-based pavement marking spray in a can with a downward-facing nozzle called "Quik-mark." It is available at industrial safety supply outlets. This comes off with a hose, but it is more difficult to do so than some of the other ideas. The next is Krylon’s "Washable Tempra Paint" spray. (Tempra is that stuff you used in kindergarten for finger painting.) This is available at large crafts-supply houses. With either of these you simply put down the template and spray around the edges. The major advantage to these sprays is that, where desired, the stencils can be made on vertical surfaces. Next is to try the powdered version of Tempra (at art supply houses). You can buy a large cup-sized sprinkling container – like a large pepper shaker – and sprinkle the dry Tempra around the edges of the template. You might want to get a sprinkling container that comes with a plastic cover that goes over it so that moisture won’t condense on the material and make a mess between uses. Another way would be to get an old Johnson & Johnson baby powder container with the top that twists to open and close the sprinkle holes. Depending on the material, you may need to enlarge the holes a bit. Using the idea above, buy a 10 pound container of line chalk (like they use on baseball fields) and use the same method. The line chalk can be found at sports outlets that specialize in team sports. The simplest idea is to use the baby powder in the sprinkle container it comes in. It doesn’t stain; It can’t be classed as "paint" (it is just talc). 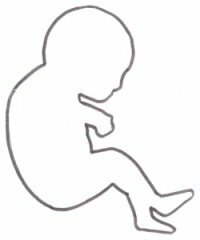 There is an extra advantage to this: Not only does the abortion-bound mother get to see these baby outlines, she gets to smell that fresh baby powder scent to remind her of who she is killing. Test these on a sidewalk in front of your house and try to wash them off with a hose to determine which is easiest to clean and which you want to use. 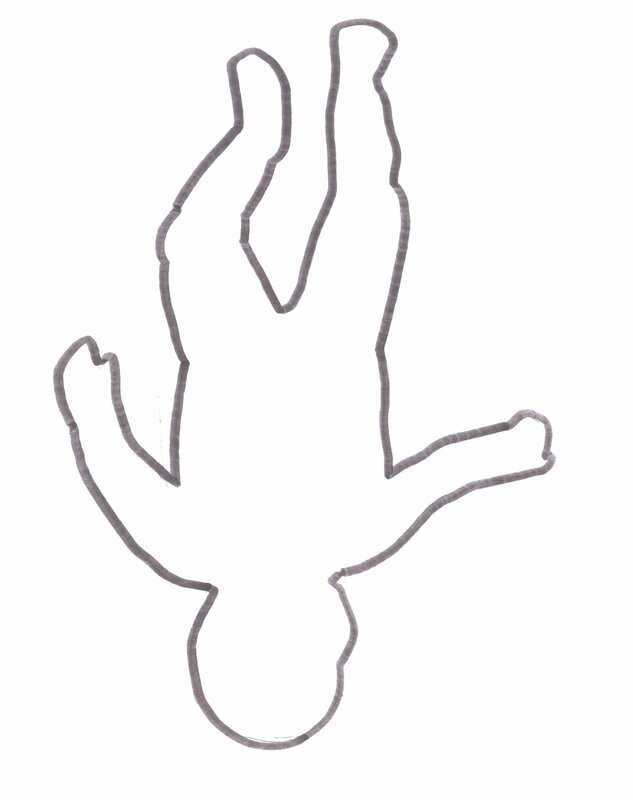 Now, the chalk outlines look good and make a point, but the point can be made stronger yet with the addition of blood. Of course you can just dribble a little liquid, red Tempra on the spot, or you can go for the whole Magilla – theater blood. To make theater blood, simply mix equal parts of clear corn syrup and Grenadine drink mix. Buy a plastic ketchup squirter (one that has a little snap-on cap), fill it and you are loaded for bear. Both are water-soluble and should clean up well. As with your choice of chalk outline material, you might want to test its cleanability on your own sidewalk before deciding. 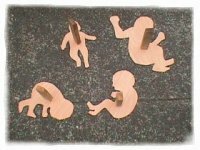 In addition to dead baby outlines, you can also create stencils with "Stop Abortion" or "Abortion Kills" to put on the sidewalk as well. 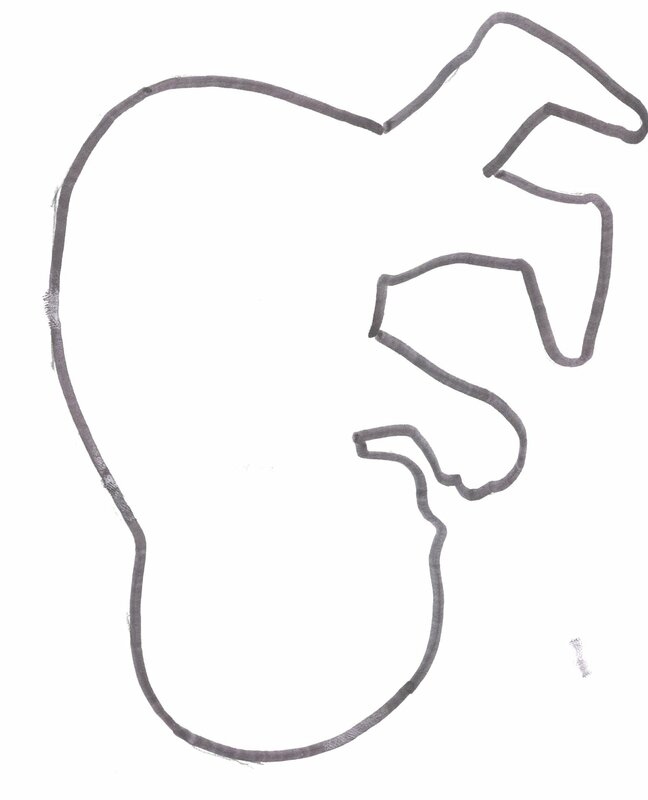 This would enhance the meaning of your baby outlines. A lot of people like using the huge signs – either dead or live baby pictures. (Available through Chet Kilgore, N2639 Hwy. Z G142, Dousman, WI 53118, 414-495-8459) However, when they are mounted on the light weight insulation panels, they become unwieldy and difficult to carry in the average car. First, you have to get the super-heavy-duty, laminated versions of the signs. They are more expensive, but worth it. Then you get a paper punch and make four to six holes along the top, bottom, and sides. Be careful not to get them too close to the corners – about 8 to 10 inches away. Then you get 3/4 inch PVC plastic pipe at your local builder supply house. Get the electrical type, as opposed to the water type, as it is stiffer and will not bend too easily. Also get four "L" connectors and four straight-line connectors – and some good glue. Buy a large bag of long, plastic wire (zip) ties (You know, the ones they used on you as handcuffs when you were part of a large rescue back in the old days.). With the poster laid out, carefully create a frame from the PVC that is somewhat larger than the poster. Be careful when you cut it to allow for the connectors. Put the wire ties through the holes punched in the poster and cinch them loosely around the PVC frame. The wire ties nearest the corners should be somewhat looser than the others should. Adjust the wire ties to have a loose fit. Clip off the excess portions of the wire ties. Then, disassemble the frame and carefully pull out the PVC from the wire tie loops. Glue a corner "L" connector on each length (see picture with partially assembled sign). For some, this may be the end of the matter, but, if your trunk is like mine and the "long" sides are too long to go across the trunk, you may have to modify them. In this case, I cut off a section of the long sides (about a quarter of the way from the end without the "L" connector) and put in a straight line connector and glued it to the short piece. This way the long sides can be shortened for storage. I usually leave the short end pieces of PVC in the loops and just use them to help roll up the sign for storage. I get a short bungee cord to wrap around the rolled up sign to hold it down to small size – otherwise it will unravel in your trunk and make it difficult to control. (Be careful to carry it level or the PVC pieces will slide out.) I also use a short bungees attached to the area near the back of the car inside the trunk and lash down the long side stantions as well as the rolled up sign. One of the great visual aides for our work is costuming. I recommend finding ways to make your point visually through costumes or other props. Many have used "bloody" medical scrubs or lab coats. One friend uses a full-body costume of Satan. This way, when the pro-aborts or their customers start calling out their slogans, he agrees, i.e. Them: "Hey, It’s her choice!" Satan: "That’s right! That’s my philosophy! After all, you can’t afford that kid. You need to make that BMW payment!" Others use a ball and chain. One of my props is to have some torn up, rubber baby parts in a container of theater blood (see above) and keep lifting out the pieces with a set of medical forceps (available at medical supply houses). 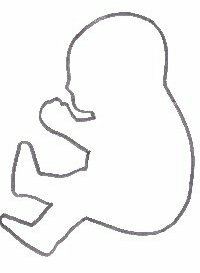 Some of the biggest abortuaries are inside churches. Babies are aborted every Sunday while their parents stand in church supposedly worshipping God. This is because many Christian women in otherwise-good churches (not counting the apostate groups that have pro-abort stands) are on the Pill or the IUD – both of which are abortifacient. I hand out a pamphlet called "Is There Blood on Our Hands" at these churches – usually as the silent Grim Reaper. You can download the Word document for it. Print both sides on one paper and tri-fold it, and you are ready to go. (Click here to download) You are welcome to change the contact information at the end to your own. Besides birth control abortions, one survey shows that one in five women having surgical abortions describe themselves as "evangelical Christians." Long-time sidewalk counselors tell of seeing the daughters of local pastors going into clinics – sometimes accompanied by their parents. It is common to see Christian "fish" symbols and other emblems on the cars pulling into the parking lots – especially in the South. It is small wonder why the churches won’t speak out against abortion. Their souls are in the grip of their own blood guilt – whether they are aware of the chemical abortions they are committing or not. They are frozen by their own sins. Pastors are often afraid to speak out. They claim that they don’t want to "hurt" those women who have had abortions. While the definition of "hurt" here is in dispute, I believe that the motive is, by and large, more crass. They are afraid that financial supporters (whether closet pro-aborts or "hurting women") will abandon the church if they speak up. Our message needs to go to churches as well. In fact, most of my anti-abortion activities take place outside churches or Christian events. The sidewalk messages might be particularly fruitful here where they consider themselves to be "pro-life." 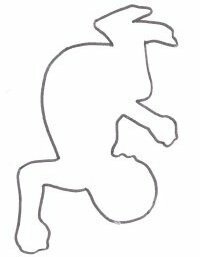 When you get a complete rejection of the anti-abortion message at a church, you might pray about the Ichabod stencil with the chalk. Ichabod means in Hebrew, "The glory is departed." It was what God said about the Jews at one time in the Old Testament when they had left off following Him and the chief priest, Eli, would not confront his sons for their evil. This is the equivalent of what the churches are doing now when they reject God’s command to protect the innocent and the "priests" do not rebuke the people for their own bloodguilt. Since I believe in "obscurity" as a means of getting the message out (see below), I made my stencil in Hebrew. However, I think that the Ichabod message is prophetic. I will never put it anyplace unless I truly believe God has told me to do so. It is similar to shaking the dust from your feet in its implications (Matthew 10: 14-15), so it should not be treated lightly. A lot of people are under the impression that Jesus used parables to clarify His message. Nothing could be further from the truth. Jesus was sent to God’s people, so God expected them to have taken advantage of His Word and all that they knew to help them understand what the kingdom of God was all about. However, as always, God’s people were dense, ignorant, and willfully disobedient. Historically, this is how God operates. He will speak plainly to someone the first time. If the person resists the truth, He speaks it again, but less plainly. The message gets more obscure as it is repeated to the hardened heart. In this kind of work, it is a distinct advantage to make your message a little more inaccessible. My Grim Reaper costume and use of a Hebrew script stencil make sure that only those who really have an inner compulsion to hear the truth, will dare to put in the extra effort and time to uncover the truth I am dispensing. These are just a few ideas. Have fun coming up with new ones – and share them with others. In fact, share them with me. I will add them to this site when it is appropriate. Go out and spread the truth. Enjoy it as much as possible, but be ready for opposition. Don’t count on "seeing" results. Expect opposition to be strongest among your own household and the "household of faith." These will not understand what you do. They will forever be suggesting "better ways to spread your message" while never lifting a finger to proclaim truth themselves.